Thank you for your support during this difficult time. Please enhance this tribute to Pamela by adding your memories and photos. Pamela Grooms Herron, 65, of Charleston, South Carolina, widow of James Gordon Herron entered into eternal rest Thursday, March 14, 2019. Her service will be held on Monday, March 18, 2019 at 12:00 P.M. at Riverview Memorial Park. Arrangements made by J. HENRY STUHR, INC. DOWNTOWN CHAPEL, 232 Calhoun Street. Pamela was born November 23, 1953 in Charleston, SC to the late Edward and Willie May Grooms of Charleston, SC. She had extreme dedication to her friends and family. Pamela had a very strong wit and extremely good sense of humor. She was retired from Roper Hospital. She is survived by her sons, William Gordon Herron (Taylor) of Summerville, SC, James Edward Herron of Florida; sister Barbara Grooms Warren of Johns Island, SC; two half siblings Patricia Grooms Welcher and Edward Andrew Grooms; and granddaughter, Skye Aleece Herron. Barbara, I am so sorry to hear about Pam. It has been years since I have seen her, but I was just thinking about her the other day. You and your family will be in my Prayers. So sorry to hear about Pam's passing, Will keep the family in our prayers. Alice (Mullins) Craven and Jan (Mullins) Ellmers- cousins. Will, it has been a very longtime I am so sorry to hear about your Mom. You and the family will be in my Prayer's. Our prayers and thoughts are with Will Herron and his family at this sad time. Be strong and present to support each other at this difficult time, nothing will make your mother more proud as she now watches over you from a much better place. Be strong and keep your mom close with your favorite memories. May God wrap his arms around you! RIP! Tell James hi from the Fralix's and give him a big hug! Happy memories of baseball, coaches, parents, parties!! HOOK EM! PAM! 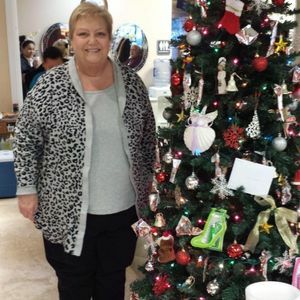 Life Stories provides friends and families a forum to post their favorite stories and memories of Pamela Grooms Herron ensuring the precious experiences are never forgotten. Share joyful times, post a photo that captures the moments you cherish, and allow others to reply, relive and remember.